David Kirby and Lee O'Brien arrived in Paris on Sunday 17th May, completing their charity bike ride in aid of Grove Cottage. 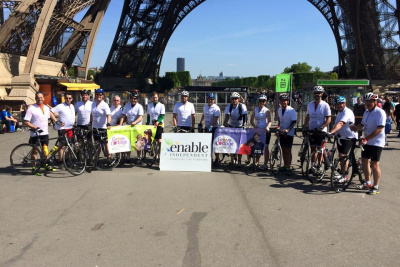 The ride, organised by Enable Independent flp, started on Friday 15th May in front of the London Eye, and the 16 riders covered nearly 300 miles to reach their destination. David and Lee raised almost £3,000 towards Enable's target of £15,000 for Grove Cottage. This target was smashed and the total currently stands at £17,800.